Here’s Day 2 of the Three Day Quote Challenge! I was nominated by My Life and A Journal. Once again, thanks for nominating me! The rules for this challenge are:. Post a quote for 3 days in a row. Nominate 3 bloggers everyday for this challenge. So today’s quote could be considered more of an excerpt from a book. I’m going to consider it a quote anyway because I love it so much. 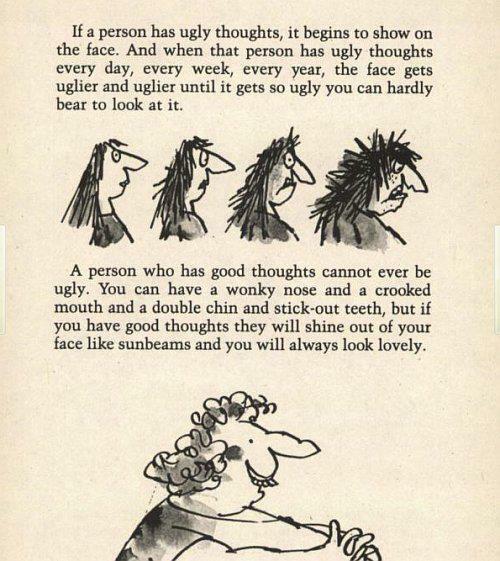 If a person has ugly thoughts, It begins to show on the face. And when that person has ugly thoughts every day, every week, every year, the face gets uglier and uglier until it gets so ugly you can hardly bear to look at it. It’s from Roald Dahl’s book entitled The Twits. This quote definitely has inspired me to love the skin I’m in and to take care of my body, physically and mentally! Lovely quote, I remember reading Matilda, BFG and others. A big part of my childhood. Have you read his autobiography(s)? I read many of his books as a child as well! I don’t believe I have read any of his autobiographies though! If you have, would you recommend them? He has divided his into 2- Boy and Going Solo (You can google them, it’ll be much better than I explaining). I liked Going Solo, it mainly dealt with Dahl’s experiences in WW2, so its nice enough if you feel like reading it ( short too). I had just seen this! Lovely quote by the way.